Right, that's your lot for the night. We'll see you all tomorrow. catch up on all the goals here, and watch Match of the Day: FA Cup highlights, 22:30-23:35, BBC One. Crystal Palace manager Alan Pardew said: "I'm a little disappointed that we didn't play better today. I thought Liverpool deserved to win and they had a bit more control than I would've liked. "It was too easy for them at times and we need to correct that next time we play them. They have great technical players, we chased as hard as possible but we came up against a team that we need to learn from." Plenty more FA Cup action for you all to enjoy on Sunday. Liverpool lost 3-1 at Crystal Palace on 23 November and Reds' manager Brendan Rodgers felt that game may be a turning point in their season. "It wasn't a good feeling the last time we were here in terms of our performance level," said Rodgers. "That was a real adverse moment for us and from that the team has got better. It was a really good win against a tough team today, but I thought we deserved the win. "We started slowly but once we scored we took control. There's a great resilience and the team are functioning really well. "Mario Balotelli has quality and he has impacted on the two games this week really well." Who's your favourite to win the FA Cup? Bola Akinola: With Raheem Sterling back in this team, Liverpool should be favourites! Great run of form. Luke Baker: Tim Sherwood to bring FA Cup glory to Aston Villa! I can dream right? Mark, Worcester: With the teams that are left in the FA Cup I fancy some European football next season for Blackburn! Crystal Palace boss Alan Pardew calls the chance Dwight Gayle had to make it 2-0 'the pivotal moment' in the game. Simon Mignolet made an excellent save with his legs, and in the second half Gayle was kept very quiet by Liverpool. Full reaction from both camps to come. Over on BBC Radio 5 live, 606 is in full swing. Robbie Savage and Darren Fletcher are taking your calls and you can have your say. Robbie says: "Tim Sherwood was the right choice for Aston Villa. There weren't many strong contenders." Andy, an Aston Villa fan, says: "I don't know about Sherwood, he's a gamble. I would've preferred Jurgen Klinsmann or Glenn Hoddle." Paul, a Blackburn fan, says: "We need to prioritise the FA Cup over the league." thumped West Ham to reach the FA Cup quarter-finals for the first time since 2008. "We mustn't get carried away. It was a good performance, we're very pleased, but there's still a long way to go in the league and obviously we need a little but of luck in the next draw. "Things went our way and I'm really pleased for the players and, scoring four goals, all the punters who came to watch." "I would say it was probably coming based on what we've had to cope with over the last few weeks and I think it told on us today, there's no doubt about that. "I have to give West Brom a lot of credit - they were very good, particularly the front two." secure an FA Cup fifth-round victory at Derby. "We went for the win, we didn't want a replay. The quality of football, even with 10 men, was great and that was the important thing." "We knew what we were getting with Yakubu . He's a goalscorer and when he goes through one against one you expect him to sure. "He's very good at doing the business in that sort of situation and that makes him a great asset." Blackburn shock 10-man Premier League side Stoke and reach the FA Cup quarter-finals. "It was a hell of a cup tie. We have immense pride for the supporters and it is a terrific result for the club. "We were extremely disappointed to concede a soft goal but the lads bounced back from that. "We will enjoy tonight but I said to the players, we have to focus on Cardiff for our next game. We would like another home draw but we will take each game as it comes." "We were well beaten today, credit to Blackburn, they put the ball in good area and used the threats they had up front. We didn't deal with it all afternoon, we got our noses in front without really dictating Blackburn. We allowed them to get back into the game." JavelBleach: Favourites? What odds would I get on the mighty, historic Preston North End right now? And on Tuesday? Mo, Manchester: How are Manchester United favourites? Only thing that saved them from defeat against us was our finishing. Momentum and confidence goes a long way and I think we'll make the final now (scared about Arsenal though to be honest). Brendan Rodgers has to stop to take six photos with several people in the crowd and Crystal Palace employees on his way back into the bowels of Selhurst Park. The smile on his face is a clear message throughout. He wouldn't be drawn on whether his side are now favourites. Liverpool manager Brendan Rodgers on BT Sport: "After we scored I thought we were very good. We had 15 efforts on goal in the first half but we weren't aggressive enough. "I wanted us to keep the width on the pitch, we changed it around at half-time and it worked well for us. "Daniel Sturridge is a natural goalscorer. The worry is that his team-mates are joining in with his dancing!" Latex Zebra: Liverpool favourites? With the current holders (who knocked a stronger Liverpool out last year) and Man Utd still in, no. Zac Quinn: Selhurst Park hoodoo overcome and now 90 minutes from Wembley, nicely done. Missed any of today's action? See all of the goals and key moments on our FA Cup video page here. "Liverpool were very sensible in the last minutes. They were relatively comfortable. Simon Mignolet didn't have to pull them out of the fire with any great saves. I just feel Crystal Palace have been a little bit lightweight. They didn't produce many forceful moments of energy or passion, and Liverpool deserved the win. They were the better team overall, and it looks as though they will now have a great chance of a Wembley final." Liverpool are into the last eight, with a first win at Selhurst Park in 18 years. "You'll Never Walk Alone" rings out from the stands, Liverpool moments away from closing this one out after a fine second-half display. Crystal Palace will be very disappointed with their second 45 minutes. "Emre Can disputed it but he was definitely holding for the free-kick. A poor effort from Dwight Gayle though. He has had to defend more than he would like to today, as a striker." Dwight Gayle takes it - he goes for goal and blasts it over! Head in hands from Gayle. A waste. Will we have more late drama from Dwight Gayle and co? Fraizer Campbell is close to meeting Joel Ward's cross from the right - but he can't get there. "Liverpool are making Crystal Palace do all the running now. They are using the width of the pitch very well, forcing Palace to work hard to close them down. It's very hard work to have to chase the ball, especially at this stage of the game." You're in! Jordan Henderson strips the ball from a dawdling Joe Ledley in side his own area, Henderson waits, he tries to pick out Mario Balotelli for a tap-in but Scott Dann is across to clear his lines. That would have killed it. What they have, they hold. Liverpool hold it very nicely, but they are not being pressured particularly hard by a flat Crystal Palace. Dwight Gayle has been anonymous in this second half. Lines are open for tonight's 606 phone-in with Robbie Savage and Darren Fletcher. The show's on BBC Radio 5 live at the later time of 19:25 GMT this evening. "What we have, we hold. That is Liverpool at the moment and I can fully understand that. If they get through this game they are only one match away from Wembley, and that's another thing for Brendan Rodgers to put on his CV. But Crystal Palace have only lost one of seven matches since Alan Pardew took over." Jordan Henderson gets through some yards in a game and here he is again, overlapping the overlap to pick the ball up on the right wing, he swings in a cracking early cross to but Julian Speroni is alive to it and beats it away from in front of Rickie Lambert. Daniel Sturridge's night is done, he comes off to a few jeers as Rickie Lambert takes his place. The final change of the game sees Dejan Lovren on in place of Philippe Coutinho. Not like for like. Very much not. Palace could do with chucking on Shola Ameobi and/or Yaya Sanogo - but neither are on the bench tonight. In fact their last change sees Wilfried Zaha on in place of Yannick Bolasie. Mark, London: Sturridge and Kane would be deadly, and a partnership for the long-term! Sturridge will stretch defences and Kane will have the extra space to do 'his thing'. Come on Roy, do the right thing! Dan, Bedford: Kane's strength over Sturridge is his ability to use two feet, and he brings other players into the game in a way that only Wayne Rooney seems to do. Sturridge is a great finisher in his own right but his inability to be flexible in his shooting will limit him progressing any further. A fraudulent cup tie? Liverpool just look comfortable and Palace look content enough to go along with it. Can they raise it? "Liverpool are having a spell of controlled possession which is wise. It just eases the pressure. If the away side are disciplined from here they should be able to get through this game." That celebratory dance. Yes. I didn't want to mention it, but Daniel Sturridge performed it in duet with Alberto Moreno after his goal. What's wrong with a handshake and a swift walk back to the centre-circle? "I do like Daniel Sturridge. I like his confidence, his movement, his finishing, his calmness. I could, however, live without the dance." It has been an afternoon of handball appeals, they have come thick and fast, and here's another as Alberto Moreno's arm is hit by the bouncing ball. Again, there is nothing given. Alan Pardew disagrees with that call. In the strongest terms. Into the last 25 minutes. A reminder that you can see highlights from this, and all of the other FA Cup games, by clicking on the highlights tab above. "Now we will see if Crystal Palace are capable of changing the way they play, spurred on by the home crowd. The introduction of Jason Puncheon has added a little bit more creativity to the side, and Alan Pardew has certainly made his attacking intentions clear. Palace have to throw caution to the wind now." Mamadou Sakho is off after more treatment and in his absence Liverpool look noticeably shaky again at the back. Simon Mignolet punches the ball out to the edge of the box, it's flashed back across goal and deflects just past the post. A telling touch there and it's 2-2. Paul Collins: We've just had the biggest FA Cup shock of the weekend. Mario Balotelli actually had a massive smile on his face. Abhinav Singh Jamwal: Looks like we signed three new players in Sturridge, Balotelli and Ibe this January. Mamadaou Sakho is down in the penalty area, looks in real pain. It was an off-the-ball incident. A clash of heads with Yannick Bolasie, that's what it was. He is having some treatment. "Adam Lallana with a classic example of following the ball up. If the goalkeeper is going to parry it you want to be the first to the rebound and Lallana was one of four Liverpool players following in at a rate of knots. The manager on the touchline celebrates with his coaching staff and Mario Balotelli? He's smiling." A fine turnaround from Liverpool. Brendan's half-time words and change have done the trick as Mario Balotelli crashes a 20-yard free-kick through the wall, Julian Speroni can't hold it and Adam Lallana is first man there and steers home. He took that very well, the ball was travelling at a rate of knots. Lfcway: Get in! Daniel Sturridge! What a ball by Jordan Henderson. That's why he passes. He should never shoot! Adam Lallana is playing as the widest wide right you could imagine in the second half. Liverpool really stretching the pitch, with Mario Balotelli up front with Daniel Sturridge. Expansive, but it could prove expensive. There must be space to exploit by the pace of the Palace counter? Daniel Sturridge has been on the fringes of the game but one chance, one goal. He finished that brilliantly. If you had to pick an England XI to play tomorrow - on form and on fitness - would you have Sturridge and Harry Kane up front? Liverpool's momentum instantly flips, as Palace go close to a second goal. Liverpool just can't defend corners at the moment, making a hash of doing so again and Dwight Gayle thrashes in a low shot which Simon Mignolet does well to turn clear. "A brilliant volley. Daniel Sturridge is expert at hitting those on his left foot as they come over his shoulder. He stole in behind the Palace defence and thrust the ball home. This will make for a better game. Crystal Palace have to come out of their shell now." Liverpool's half-time tweaks bear fruit. It's been a positive few minutes and they level when Daniel Sturridge runs on to a cute chip over the top by Jordan Henderson, it's on his left foot and he doesn't try and smash it, but hits it true, through the legs of Julian Speroni and into the net. "Jason Puncheon whacked it over the bar, but it's better from Palace. They have wonderful support in this stadium and the fans will get behind their team - they understand the tactics of the opening 45 minutes. It was one-way traffic in the first half, will be there a bit more ebb and flow in this?" Great chance for Jason Puncheon, 20 seconds after he came on! Yannick Bolasie picks him out from the right, Puncheon has a shot from 20 yards but he can't keep it down! It is Mario Balotelli time! The moustachioed maverick is on in place of Lazar Markovic, while Palace bring on Jason Puncheon in place of Marouane Chamakh. I'm not sure Brendan Rodgers really does 'angry' but he doesn't look too impressed as he emerges for the second half. More urgency? More tempo? Mario Balotelli? Simon Mignolet's save to keep out Dwight Gayle's effort just before the break could well be crucial. I've just seen it back and the Belgian did superbly to stretch and kick it clear. A 2-0 lead at the break would have been massive for the hosts. Cameron Anson: Before a ball was kicked, alarm bells were ringing for how lightweight the Liverpool midfield is. Simply can't impose themselves. David D: Liverpool's plan of having all the possession doesn't matter if all they do is kick it into the defenders on the edge of the box. John Stirzaker: Can we only shoot straight at the keeper?? Liverpool have now kept only three clean sheets in their last 20 FA Cup games. Is that an area they need to strengthen in the summer? "I would say its been an average first half, but it's been quite enjoyable seeing Liverpool try to create chances against the massed ranks of the Crystal Palace defence. There are thoughts for both sides at the break. Can Palace cause more problems for Liverpool in the second half? Or will Liverpool continue to have the lion's share of possession?" "An FA Cup tie finely poised thanks to Simon Mignolet's late first-half save to deny Crystal Palace a second goal. Pape Souare, on his debut, was living dangerously with a challenge on Daniel Sturridge in the penalty area, but it is Palace who lead with a goal from Fraizer Campbell." Dwight Gayle is getting under the skin of the Liverpool players. That's the third time Gayle has gone down easily and Daniel Sturridge is furious with him. Picking him up angrily. Calm down! Fais Sam: Palace have truly developed into Liverpool's bogey team. Pace to burn and a lively atmosphere. Credit where it's due! "Crystal Palace have created chances but so far there has been very little controlled passing from the home side. They are defending resolutely though - determined, dogged defensive work. "Alan Pardew is kicking every ball in the technical area. He will be more than happy to reach half-time in front, but I do think Palace look a little bit vulnerable down the left-hand side, where Daniel Sturridge has found space a few times." Dwight Gayle for 2-0... no! Gayle should score, he's in behind the static Liverpool defence again but all credit to Simon Mignolet, out quickly and making himself really big to save with his left ankle. A big moment. More of what Lazar Markovic is all about as he picks the ball up on the right, drives inside, commits two defenders, beats another - but then shoots over from 20 yards on his left foot. He's a dangerman but without enough end product right now. Liverpool have completed more than double the amount of passes as Palace, but for all their play they've only really put one quality move together, when Adam Lallana had a shot well saved. Palace are ahead and happy to sit back and hit on the break. "What with Daniel Sturridge claiming for a penalty (see 30 mins) there have certainly been some early decisions for the referee to make, that's for sure. I always go with that great Yorkshire expression: 'If in doubt give nowt.' All of these decisions are so marginal." Liverpool still turning on the pressure, as Joe Allen fires a volley just wide from 20 yards. Into the last 10 minutes of the first half. Khalid: "Henderson needs to work on his finishing. 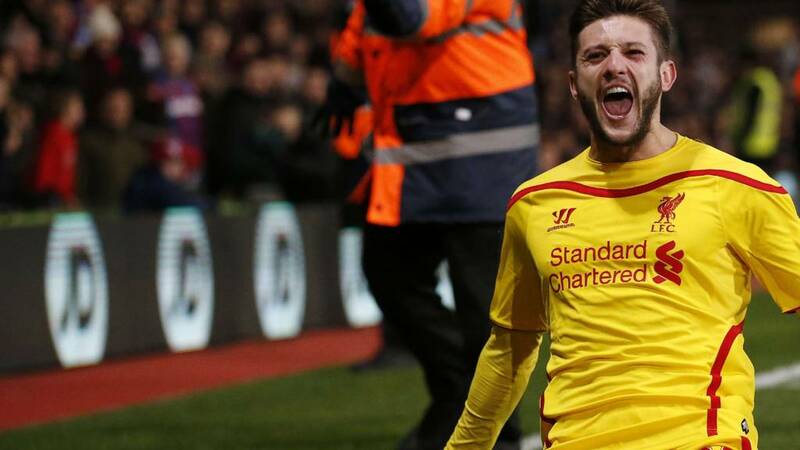 He should have shot himself rather than set up Lallana." If you haven't seen Fraizer Campbell's opener you can watch it on this page now. Just click on the highlights tab at the top of the page. Jordan Henderson is booked for a tussle with Dwight Gayle - there didn't appear too much, if any contact - and Henderson then lashes in a shot which is turned away by Julian Speroni. Great save - and then Daniel Sturridge wants a penalty as he collects a bouncing ball - no dice! Charlie: "Pardew could really build a solid cup run if Palace win today." Ade: "The one negative about Liverpool at the minute is we can be a little Arsenal like (i.e. we must literally walk the ball into the net)." Anonymous: "As a neutral, it's disgraceful how Palace have evidently over-watered the pitch. Have they got longer studs than the Liverpool players?! It's ruining the game and if any goals are caused by or prevented by slippages, surely it's a form of cheating?" Martin Skrtel must have nightmares about Dwight Gayle. Gayle tormented him to score twice in that classic 3-3 draw at the back end of last season, has already mugged him in the build-up to Palace's goal tonight and now gets past him again, skinning him inside the box. He's such a livewire. "Crystal Palace need a little breather here. Liverpool are applying the pressure. The home side need to get some passing passages together because although they've got the cushion they haven't established any rhythm yet. This is a big challenge for Jordan Henderson playing in the central midfield position for Liverpool, the position Steve Gerrard has filled for years." A tremendous block from Scott Dann keeps out Philippe Coutinho's blaster, Joel Ward then controls the ball between his chest and the floor, and somehow manages to roll away from it without handballing it. Quite brilliant from the Eagles defender. Plenty of empty seats behind the goal which Liverpool are attacking - and attack they do. Patient build-up, left to right and back again, they pass up a shooting chance, and again, but then burst into life. Jordan Henderson into Adam Lallana, great one-touch stuff, and Lallana's drive is turned away by Julian Speroni. Really fine play from Liverpool. Palace new boy Pape Souare clatters into Jordan Henderson with his knee, a really high challenge, and is lucky not to be booked. An ugly challenge. Can Liverpool find a route back into the game? "A great run by Dwight Gayle, and it was a rather anaemic punch by Simon Mignolet. He got in a bit of a mess and Fraizer Campbell, following up, thrust the ball into the net on his right foot, on the rebound. Just earlier the home fans seemed to sense something was going to happen. They raised the noise levels, and it's Palace who have been asking the questions." That worked like a dream! Palace lead and it's defensive disarray for Liverpool. Martin Skrtel dithers with a high ball in behind, his header is weak and Dwight Gaye reads it. Gayle is brave to go in for the header with Simon Mignolet. Mignolet bats it down and there is Fraizer Campbell, right on cue, to sweep home from six yards out. I'm not sure if it's just me but these 17:30 kick-offs always seem to be dull. Maybe I'm imagining it - but this has not been the most exciting game so far. Tom Bodley: Underdogs winning today's earlier matches, let's hope Pardew's Palace can continue the run. "A brilliant interception from Martin Skrtel (see 9 mins). The ball did bounce up and hit his hand but it was absolutely accidental. There was nothing the centre-back could do about that." Liverpool have had 78% of the ball so far. Utterly dominant - yet it's Palace who have had the one break of note. Is that the pattern set for the game? It's as if David Pleat has a crystal ball. Palace have their first counter which frees Dwight Gayle down the left, pace to burn, but his cross is well cut out by Martin Skrtel. In fact, it bounced up off his foot and on to his arm. David Owen: "Super Alan Pardew!" "Crystal Palace look prepared to sit off Liverpool when the away side work the ball across the back. Liverpool look quite composed, but Palace won't press too early and when they do get their chance on the counter, the home side have the pace of Dwight Gayle and Yannick Bolasie going forward." Palace defender Pape Souare is lucky to get away with the ball striking him on the hand as Lazar Markovic flicked it on, Liverpool continue their bright start. Liverpool seeing plenty of early ball, Jordan Henderson to the fore. The men in yellow construct a neat passing move together which ends with Daniel Sturridge miscuing a volley wide. Difficult height for him to strike. Stoke boss Mark Hughes: "We were well beaten today, credit to Blackburn, they put the ball in good areas and used the threats they had up front. We didn't deal with it all afternoon, we got our noses in front without really dictating Blackburn. We allowed them to get back into the game. "Blackburn deserved to go through. "For the red card, there was a little bit of contact, I have seen them given, I have seen then not given. If you don't do the fundamentals, you are liable to get punished. Absolutely no complaint, we didn't deserve anything today. "I couldn't emphasise the point enough in the lead up to the cup games. We wanted to progress. We need to get our heads down this week and not let our season peter out." "A tremendous game in prospect. Whoever wins this game will be in a higher position than the three clubs already in the quarter-finals. What an opportunity for Liverpool then if they can get a result here today. Maybe a final swan song for Steven Gerrard?" Marouane Chamakh wins a free-kick deep on the left wing and it's headed tamely into the hands of Simon Mignolet in the Liverpool goal. I saw that Mignolet credited his partner with revitalising his career this week. She's a miracle worker. Reading goalscorer Yakubu: "I was desperate to go on, I told our manager that I wanted to go on. Derby manager Steve McClaren pulled me back on the touchline and joked with me telling me 'don't do it, don't go on and score', but I did it, I did my job. "I never wrote it off coming back to England, never say never. Reading gave me the chance to come back so I'm happy to be here." Tim G: Disappointed that Emre Can hasn't replaced Gerrard in midfield. He can become a Liverpool great in that position. SoundbeatUK: Hope Liverpool take revenge on Palace. They cost us the title last season. I want a heavy win please boys. The Crystal Palace fans are right up there when it comes to atmosphere and they've gone the extra mile again today, unfurling a huge banner of Alan Pardew in that 1990 FA Cup semi-final. He's rarely looked better. Derby manager Steve McClaren: "We went for the win, we didn't want a replay and we very nearly got the win. The quality of football, even with 10 men, was great and that was the important thing, keeping that up. "We're not going to win the FA Cup so it was all about performance and keeping our style. "We could have held for a draw but we didn't want to do that, we wanted to blow the game open and we almost pulled it off. "I couldn't argue with Stephen Warnock's two yellow cards. He wanted to prove something, he wanted to show something, it gave us a mountain to climb." You can now see all of the highlights from Blackburn's mightily impressive 4-1 win over Stoke. Crystal Palace: Speroni, Ward, Hangeland, Dann, Kelly, Bolasie, Ledley, Souare, Gayle, Chamakh, Campbell. Subs: Mariappa, Guedioura, Zaha, Hennessey, Murray, Delaney, Puncheon. Liverpool: Mignolet, Can, Skrtel, Sakho, Markovic, Allen, Henderson, Moreno, Lallana, Sturridge, Coutinho. Subs: Johnson, Lovren, Lambert, Manquillo, Borini, Balotelli, Ward. Burton continued their unbeaten home run under Jimmy Floyd Hasselbaink as the Brewers beat Oxford United 2-0. They remain second, level on points with leaders Shrewsbury, who beat AFC Wimbledon 2-0. Elsewhere, York secured an important 2-0 win against Tranmere, propelling them out of the danger zone and dropping Tranmere to 22nd, just one point above the drop. Check all the full-time result from the League Two games on the League Two section of the site. Twenty-five years ago Crystal Palace boss Alan Pardew was the hero with a winner over Liverpool in the FA Cup semi-final. Pards is back on the sidelines this evening of course, and he won't wan to know that Palace have only won six of their last 29 matches in the FA Cup against top flight opposition. A stinker of a record. Fergie time? Pah. It has nothing on this. Leyton Orient snatched a winner at Chesterfield in the ELEVENTH minute of stoppage time, Dean Cox with the goal. A big win for Orient, who are deep in relegation bother. They are 23rd, but are three points off safety. At the top of League One, the top three all lost. Leaders Bristol City losing 3-1 at home to Sheffield United, Swindon losing by the same scoreline at Scunthorpe and MK Dons slumping to a 4-2 defeat to Gillingham. For the full results, head to the League One index. Adam Khan: "I have a good feeling that Liverpool will do well today, they need revenge for that terrible performance in November when they lost 3-1." "Crystal Palace will be quietly confident given the home record they have against Liverpool. They drew 3-3 last season, which everybody says cost Liverpool the Premier League title, and the 3-1 win at Selhurst Park earlier this season will give them so much confidence. One of my favourite players this season so far has been Yannick Bolasie. Every time he gets the ball he takes people on and as Palace counter they could cause Liverpool real problems because they lack pace." Anonymous Stoke fan: Congrats to Blackburn, but it was a poor effort from us and that's eight goals conceded in two games now. We really miss Shawcross and Bojan. Only 8,000 Blackburn fans turned up to see that though - poor effort! "Alan Pardew has had an outstanding start as Crystal Palace manager but Liverpool's season has also changed completely in recent weeks. Reds boss Brendan Rodgers has established a system that works with the players they have got, plus they have got competition for places and Daniel Sturridge is back fit. "Jordon Ibe's emergence is a bonus too - he has come through and has done extremely well, and it is like having a new signing. Liverpool have pace, youth, lots of different attacking options and a nice balance to their side. I think their FA Cup run is going to continue." "This was a terrific cup tie from start to finish. Stoke got off to great start, then we all sat back waiting for the second but it didn't happen. Blackburn settled down and in the end, Josh King had too much pace. He was excellent and they deserve their win. "Blackburn had confidence from the way they beat Swansea. In the second half, the two central defenders settled down and they handled everything well. But this will always be remembered as Josh King's game." Bournemouth are top of the Championship after drawing 1-1 with Huddersfield but the real story in that division is at the bottom of the table where a topsy-turvy encounter between Blackpool and Nottingham Forest has ended 4-4. Hosts Blackpool led 2-0, Forest fought back to 2-2, twice went ahead but a last-minute equaliser has earned battling Blackpool a point. The home side also had a player sent off, and were later down to nine men after an injury and using all their subs. "Can we play you on the beach" was the chant from Forest fans, the terrible state of the pitch meaning both sides had to abandon a passing game and go direct. Crazy game. Elsewhere, Watford scored a last-minute winner to beat Bolton 4-3 while Ipswich won 2-1 at Fulham. Finally, Norwich beat Wolves 2-0, Leeds edged Millwall 1-0, Charlton beat Brentford 3-0 and Sheffield Wednesday's game against Brighton ended goalless. Gregory P: Derby may be out of the cup but can go back top of the league on Tuesday. Promotion was always the season's aim. Sulaimon Adelekan: Feed the Yak and he will score! He still has it! "Liverpool are playing exceptionally well at the moment. Daniel Sturridge is back, and he is a little bit rusty but because of his movement alone he could have had a hat-trick in the first half against Tottenham. Crystal Palace are a great counter-attacking side and there will be a red hot atmosphere at Selhurst Park but I just think Liverpool are riding the crest of a wave right now. They are playing such fast and exciting football that I can't see them losing." Over in Spain, league leaders Real Madrid are looking to extend their lead at the top of La Liga to four points with victory over visitors Deportivo. Despite having a Champions League fixture away at Schalke on Wednesday, Real have named a strong line-up including Cristiano Ronaldo, Gareth Bale and Karim Benzema. So Blackburn Rovers, Reading and West Brom are three of our last eight in this season's FA Cup. It's anyone's. Will Palace or Liverpool join them? An excellent win on the road for Reading. Steve McClaren is fuming. Will he live to regret that red card from Stephen Warnock on his debut? Rudy Gestede makes it five! But no, Jack Butland was fouled in the build-up. Classic. James Chapman: Couldn't have managed it without the Stephen Warnock red but Derby v Reading has been a classic! Feed the Yak and he will score! RED - NO YELLOW CARD! What is going on here? Stoke midfielder Glenn Whelan is shown a second yellow card for encroaching at a free-kick. He's off! But hang on. The referee goes to consult with his fourth official and decides that in fact, he hadn't already booked Whelan, he stays on. I'm not sure anybody really knows what happened there. If you had money on a Josh King hat-trick today then all the best of luck to you. Blackburn cruising into the last eight, 90 minutes from Wembley. "Yakubu does really well. Hal Robson-Kanu slips him in and as soon as it goes into him you know he is going to hit the target with a low shot, into the corner. That is no surprise to anyone. You may not get him chasing players down, but Yakubu will score you goals." Yakubu! He's only been on the pitch for a few minutes but the veteran has fired Reading ahead! He stays onside, has no real pace left any more but shows good strength to hold off the chasing defenders and firing in a low left-footed shot. His first goal in England since May 2012 - for Blackburn against Chelsea. You never lose it. Rob Zabrocky: Just to capitalise on my mockers, Blackburn Rovers can't win the cup, England are rubbish at cricket and I will never win the lottery. Crystal Palace make five changes to the side that drew with Newcastle in their last game. Defender Pape Souare makes his debut for the club while Scott Dann, Yannick Bolasie, Dwight Gayle and Fraizer Campbell all come in. Mario Balotelli's goalscoring heroics against Tottenham have not earned him a place in the starting XI for Liverpool. He is on the bench, with Daniel Sturridge leading the line. Instead, Brendan Rodgers' two changes sees Joe Allen and Adam Lallana make starts. Into the last 10 minutes at Derby. Can the home side hang on for a replay? Joe: "After a rough last few months, my first love got me exactly what I wanted for Valentine's Day! Cheers for the special day Blackburn! #COYR"
Immsy: OK what did I miss? Was doing the house cleaning and switched off the TV, and Blackburn score four?! Andrew Barnes: Stoke obviously couldn't do it on a cold afternoon in Blackburn. It's not your day Stoke. Blackburn defender Shane Duffy gets away with a clear-cut handball in the penalty area. I doubt it would make much difference now. "On the basis of what he have seen today, Josh King not having scored too many goals this season already has to be down to confidence, because he looks a top striker. He has run Stoke's defence ragged today, and they are a Premier League side. Stoke will be disappointed with their application but Blackburn have attacked this game. They're 4-1 up, but it could be more." "You have to give credit to Blackburn. They never gave into Stoke after going behind, apart from a little spell just after the goal. They've been the better side since then. They've settled down at the back, coped well with Crouch - who we said would be the danger man - and the pairing of Gestede and King has caused problems round the back. That threat has never been extinguished by Stoke." Almost a brilliant goal for Blackburn! Craig Conway summons the spirit of Ricky Villa to dance into the penalty area from out on the right wing, he beats one man, beats two and just has the keeper to beat - but drags it wide! For a moment the magic of the cup was well and truly alive. A little under two years ago Wigan were lifting the FA Cup trophy. This afternoon, they slumped to the bottom of the Championship as Blackpool are beating Nottingham Forest 3-2. Elsewhere, Huddersfield have drawn level against promotion chasers Bournemouth, with James Vaughan making it 1-1 while Watford have battled back at Bolton, 2-2 there. And another great chance for Reading at the iPro! Pavel Pogrebnyak has a free header six yards out but it's well saved by Kelle Roos. Jamie Mackie grabs the rebound - but fires wide. Almost five! Rudy Gestede is up to plant a header a the back post and Jack Butland makes an excellent save to push it away. Jack Grant: Right Tim Sherwood. Task number one - get Darren Bent back to Villa Park! isn't a recall option in the loan deal. Blackburn forward Josh King is not usually prolific. In fact, he had only scored seven goals in his career before today. He has scored three in 19 minutes to leave Stoke on the rack and Blackburn in the hat. "Even though they are down to 10 men Derby have kept going and who else to score but Darren Bent? It defies logic that he hasn't been in the Aston Villa team, that he has been shipped out on loan. Derby are a very good side challenging at the top of the Championship but I can't believe Bent wasn't given an opportunity at Villa this season." Tom: "I live in Bristol so don't get to travel to Ewood Park all too often. But how I wish I'd made the effort today! C'MON ROVERS!" Nasser: "Don't be surprised about Rovers thrashing Stoke and Swansea. If it wasn't for Venkys' incompetence we'd still be in the Premier League sorting these mid table teams out. Go on Rovers!" A good day at the office for Pep Guardiola as his Bayern Munich side stroll to an 8-0 win against Hamburg. Real Madrid are in action later and we will have a live text commentary on their game against Deportivo from 16:30 GMT. If you've ever been annoyed playing Fifa against someone who has Pierre-Emerick Aubameyang up front, you'll know how Stoke's defence feel playing against Josh King today. Time and again the ball is hit into space and he runs past them with ease. Too fast. Way too fast. There could be more goals in this yet. Alex Withington: OK I've lost my cool now (see 16:11). All hail the mighty Blackburn! Jay: Can someone tell me how this Blackburn side is not competing for one of the play-off positions? "I don't think Stoke have done anything about King. It's just a simple ball over the top again and it's divided the two defenders. King's pace put him through, and at this moment in time he's the king of Blackburn!" "We thought it was a replay of his previous goal (see 16:18). It is just ridiculous - Josh King has been running in behind all game. Steven N'Zonzi, tracking back, looked like he was running in treacle. Stoke have made this far too easy for Blackburn." That's what he's paid for! Darren Bent is in the right place, at the right time to steer in Jesse Lingard's shot with his groin. A painful blow, but one that puts Derby back in with a shout. Can the 10 men go on from here? Craig Gardner: "Great result from the boys again today. One win away from Wembley." West Brom thumped West Ham to reach the FA Cup quarter-finals for the first time since 2008 earlier today. "Since the break Derby had been playing exceptional football. You would have thought it was Reading who had 10 men, but they break away, and on the counter Hal Robnson-Kanu had enough time to take a touch and finish after a cut-back. It's a cruel game, football. Now Reading are on the front foot." Torched. Stoke's makeshift back four is torn apart by the pace of Josh King once again, they are all over the place and he burns away from a frankly half-hearted chase back by Steven N'Zonzi to slot into the corner. A hat-trick, and a place in the last eight. Steve Sidwell is on for the stricken Marc Muniesa, I think Steven N'Zonzi is in at centre-half. Stoke well short of defenders, and they let Robert Huth go out on loan on deadline day. "Blackburn have dominated in every single department. Josh King has been consistently running in behind, causing Stoke problems with his pace. This time he gets away and his finish was excellent. He just slides it in the bottom corner. King is playing at the top of his game and richly deserves his goals." A nightmare for Stoke. Absolute nightmare. Stoke defender Marc Muniesa pulls up as he chases a long ball back, hamstring gone, he's down and it allows Josh King to run on and bury his second of the day. It's a long way back for Stoke now. With 10 men. Muniesa is finished, carried off the pitch. The touch of Bryan Robson, the finish of Kanu! Lovely goal from Reading forward Hal Robson-Kanu, collecting a cross from the right and calm as you like, curling into the net. Lovely touch. Derby - down to 10 men, remember - make a shaky start to the second half and Simon Cox has a shot well blocked for Reading. "Mark Hughes is out of his box, after spending most of the first half inside it. He'll have had a word with his troops at the break, because the few minutes before the they were second best." Ironic cheers and the odd 'Hallelujah!' from the away end as Stoke win a free-kick. Safe to say referee Anthony Taylor isn't on Stoke fans' Christmas card list. Or Valentine's, for that matter. Deng Leek: Good to see teams from the lower division giving the Premier League giants a run for their money. Alex Withington: Must. Stay. Calm. Still 45 minutes to go. Come on Blackburn Rovers! Darius Basu: Blackburn have had five opponents sent off in their last five FA Cup matches. How about that? And we are back up and running at Ewood park. A half-time sub for 10-man Stoke as they reshuffle at the back - Andy Wilkinson is on for Marko Arnautovic. "Stoke have to go for the game now. They are a goal behind but with the players they have, forward-thinking players, they are capable of getting back into it. It will take a big effort from them though." Everything but the goal. That was the story of the first half in Derby. Can we get some now? They are back under way. appointed manager at Aston Villa, signing a contract at the club until summer 2018. Remi Akinyombo: Sherwood's stock is high because he had the highest win percentags of any Tottenham manager. Pretty good selling point. Jon Evans: Tasty appointment. Sherwood and Villa have a point to prove. Make or break for both sides. Shrewsbury and Burton, first and second in League Two respectively, are 1-0 up against Wimbledon and Oxford United. Results elsewhere means they could be set to build a little cushion over their competitors because Wycombe, third, are losing at home to Newport 1-0. Elsewhere, there are a lot of disappointed Northampton fans on John-Joe O'Toole day because the midfielder in question has been sent off for the Cobblers in the first half. The good news is that they are holding Mansfield to a goalless draw at the break. "Blackburn have done really well to get back and Josh King has played a big part in that. He's scored one goal and got brought down for the other. He gives his team that bit of energy." The top two in League One are both ahead in their games at the break. Bristol City are 1-0 up at home to Sheffield United, while Swindon are winning at Scunthorpe by the same scoreline. That is bad news for third place MK Dons, who started a day one point behind second-place Swindon. They are 2-1 down at Gillingham. Other notable scorelines are Colchester, in the final relegation place, 1-0 up at Oldham while strugglers Crawley are 1-0 up against managerless Barnsley. Natalia Bradford: Lovely to see Rovers go into the break against Stoke leading 2-1. This is a Stoke side who can't deal with the long ball up to a big man. Tony Pulis will be appalled. Josh King and Rudy Gestede are causing all kinds of problems up top for Blackburn - and Jordan Rhodes is on the bench too. "Rudy Gestede has missed a couple of chances already but he was so confident with the penalty. He just stepped up, waited for the goalkeeper to go one way and coolly slotted the ball home. You can see why Premier League clubs have been looking at him. Worst case scenario for Stoke. Concede a penalty and get a man sent off." "A great penalty from Rudy Gestede and Blackburn deserve it. What a fantastic time to score, right on half-time. Stoke now have to come back after the break and find something. Have they got it in them? This is where the manager earns his coin." Stoke were 1-0 up early on but have been pegged back - and perhaps crucially - are down to 10 men. Have you got a plough? Their pitch is not the greatest but struggling Blackpool won't care because they lead Nottingham Forest 1-0 at half-time, Gary Madine with the goal. Elsewhere, current Championship leaders Bournemouth head down the tunnel 1-0 up against Huddersfield. Two goals in as many minutes means Bolton lead Watford 2-1 while Leeds are beating Millwall, in the final relegation place, 1-0. Other half-time results are: Fulham 0-2 Ipswich, Norwich 1-0 Wolves, Sheff Wed 0-0 Brighton and Charlton 1-0 Brentford. Cool as you like. In front of the thousands of away fans Rudy Gestede rolls in his 14th of the season. Blackburn on their way into the last eight? He has to go! The American Geoff Cameron is dismissed.